Happy Onam! The joyful festival of Onam originates in Kerala. It celebrates the auspicious appearance of the Vamana avatar of Lord Vishnu and the homecoming of Mahabali and it also marks the Malayalam new year. Onam is enthusiastically celebrated with worship ceremonies, beautiful flower arrangements, boat races, traditional dance performances, martial arts, music and elaborate vegetarian feasts. According to the Bhagavat Purana, Mahabali was the grandson of the saintly devotee Prahlad Maharaj. Mahabali was a mighty warrior who conquered the devas (demigods) and ruled the three worlds. 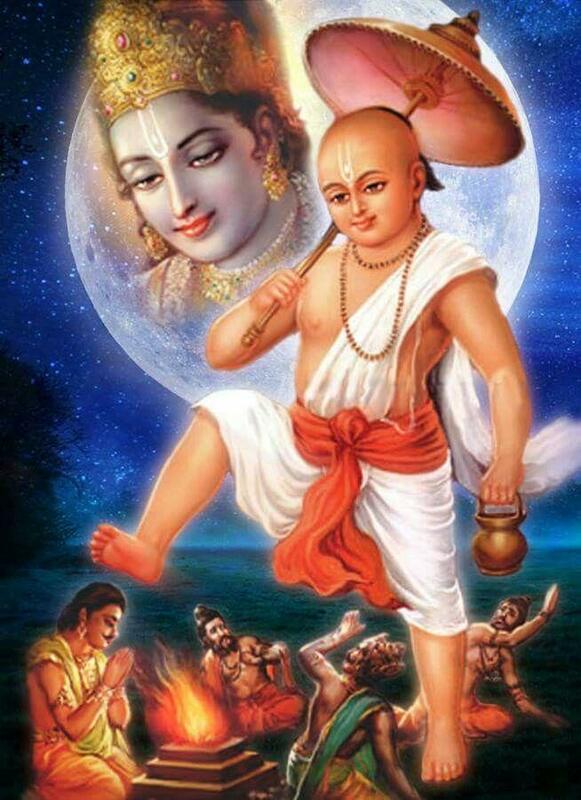 The devas sought help from Lord Vishnu who descended in the form of a gloriously effulgent dwarf brahmin boy, Vamana. At an opportune time, Vamana approached Mahabali asking for alms. Mahabali promised to give Vamana anything He wished for – land, gold, jewels – but Vamana said that greed destroys a person and He would only take three paces of land from him. After Mahabali had made the promise to give Him the three paces of land, Vamana expanded in size revealing His cosmic form. With His first step He covered all the lower planets up to the earth, and with His second step He reached all the way to the top of the universe. His toenail pierced the universal coverings and the water of the Causal Ocean surged in, washed the Lord’s lotus feet, and descended into our universe as the celestial Ganges. Mahabali then placed his head at the feet of the Lord and offered himself as the place for Vamana’s third step. For this act, Mahabali has become renowned throughout the ages as the devotee who exemplifies full surrender to the Lord. Vamana was extremely pleased with Mahabali and gave him the celestial planet, Sutala, to live on. Vamana also resides there with him. Onam celebrates this glorious event and is also the time that Mahabali returns to visit Kerala.